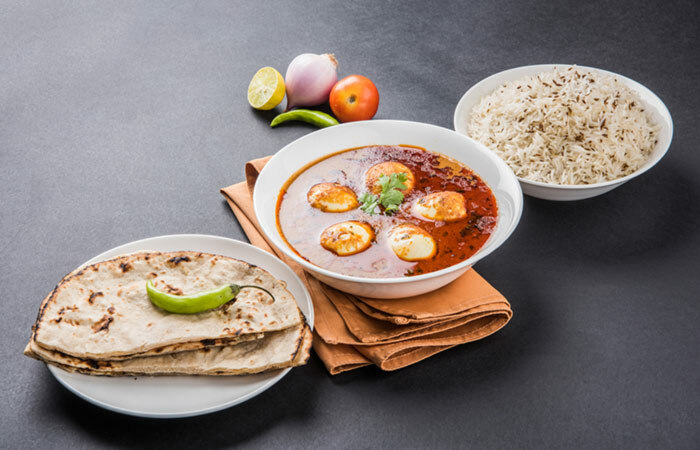 Bored of eating the same egg curry again and again? 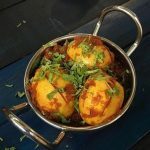 Then you must try these delicious and quick egg curry recipes made with simple ingredients, a pinch of creativity, and a dollop of happiness! 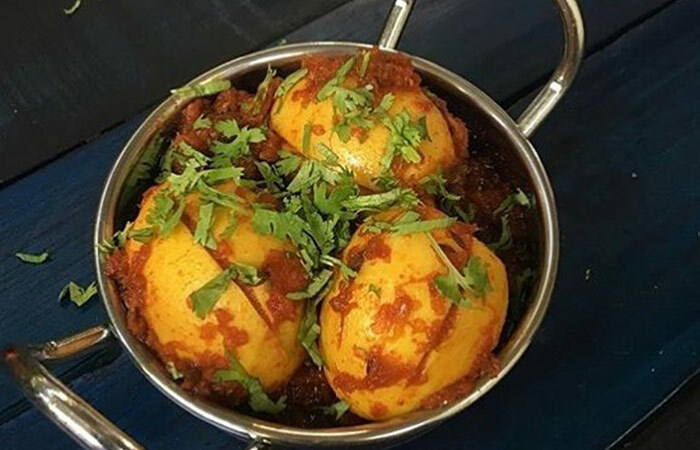 Moreover, eggs are a great source of protein, vitamins, minerals, and antioxidants (1) that help improve eyesight, prevents hair loss, aids weight loss, provides essential amino acids to the body, and helps improve brain function. However, you should avoid consuming any more than 2 eggs per day, especially the yolk as it can raise your cholesterol levels. 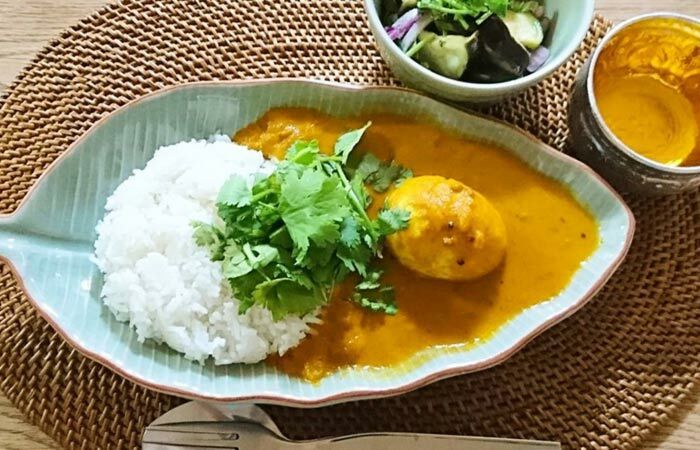 With that note, let me tell you how to prepare tasty egg curries in just a few minutes time. 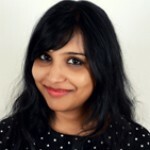 You can devour these curries with white rice, brown rice, roti, or paratha. Heat the oil in a pan and fry the eggs until golden brown. Remove from oil and keep aside. In the same oil, add bay leaf, cardamom, clove, and cinnamon. Fry for 20 seconds. Add the pureed onions and cook for about a minute or two. Now, add the ginger and garlic paste and cook for a minute. Add the tomato puree and cook for 30 seconds. Now, add the coriander powder, cumin powder, turmeric, red chili powder, and salt. 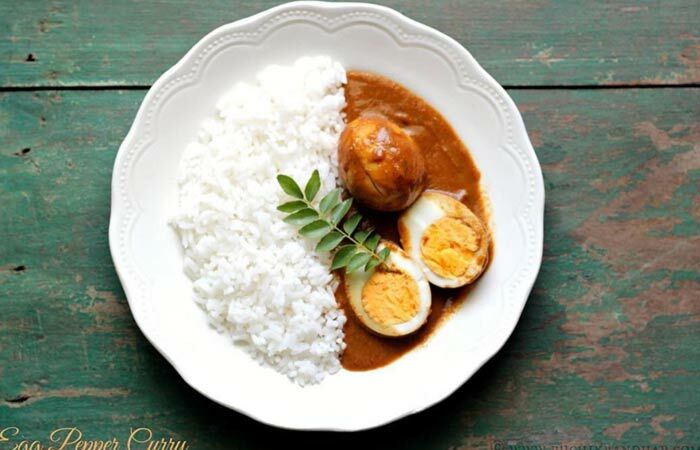 Cook until oil starts to leave the curry paste. Now, add a little water and cook for 2 minutes. 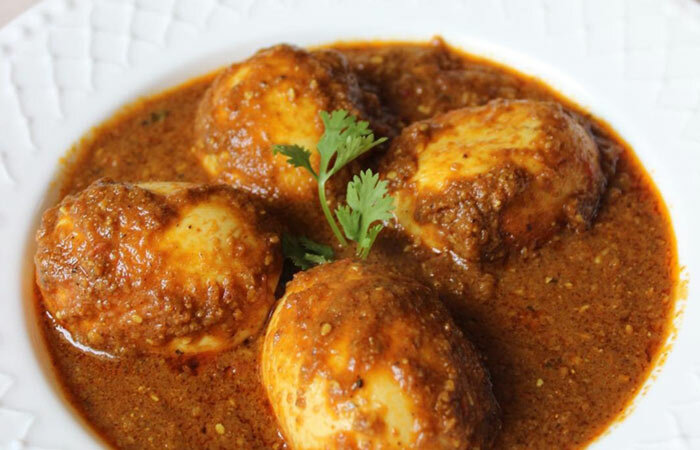 Carefully add the eggs and stir well so that the curry paste get coated all over the eggs. Then add water, green chili, and kasuri methi and let it come to a boil. After about 2-3 minutes, sprinkle garam masala. Cook for a minute or two more. 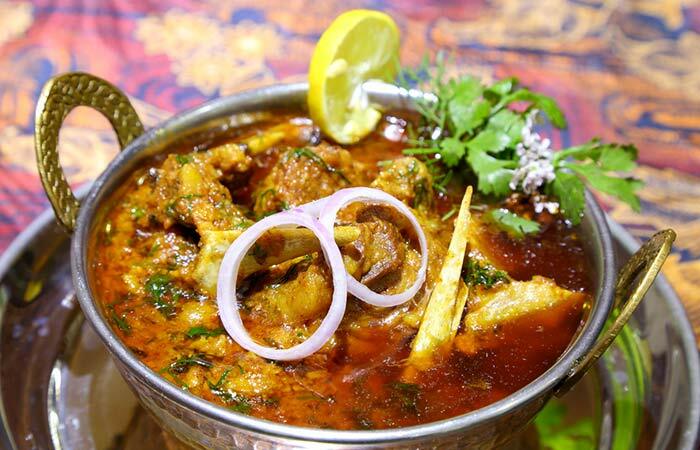 Remove from flame and garnish with chopped coriander leaves. Heat the oil in a pan and add fennel seeds and curry leaves. Cook for 20 seconds. Now add the chopped onions and cook till they become translucent. Now, add ginger garlic paste and cook for about 3 minutes. Add coriander powder, red chili powder, Kashmiri red chili powder, garam masala, turmeric, and salt and cook till oil starts leaving. Drop the eggs in and cover and cook for 5 minutes. Now add coconut milk and mix gently. Mix mustard seed powder, turmeric, and red chili powder in a bowl with a little water. Heat the oil in a pan and add the nigella seeds. Cook for 10 seconds. Add the sliced onion and cook until they become soft and translucent. Add the mustard seed powder mix and cook for 20 seconds. Add the eggs and cover with a lid. Cook for 5 minutes. Add the bay leaf, star anise, cumin seeds, fennel seeds, cardamom, clove, and cinnamon. Fry for 20 seconds. Add the chopped onion and green chili. Cook until the onions become soft and translucent. Add ginger and garlic paste and cook for about 1 minute. Add the chopped tomatoes, coriander powder, garam masala, and salt. Cook till the tomatoes become soft. Now, add the poppy seed paste and coconut paste. Cook for about 3 minutes. 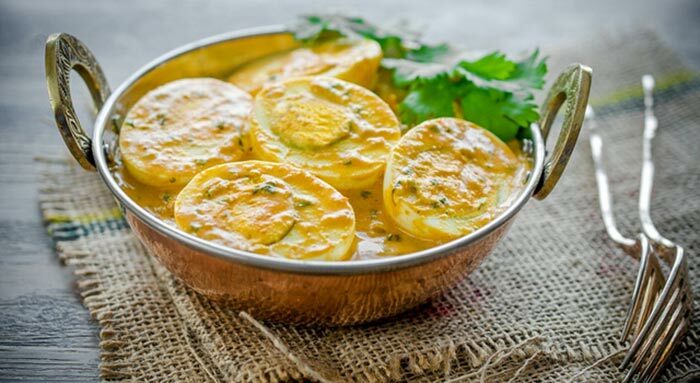 Add eggs and mint leaves and stir carefully to coat the eggs with the curry paste without breaking them. Add water and bring it to a boil. Cover and cook for 5 minutes. Add cardamom, clove, cinnamon, and cumin seeds. Fry it for 30 seconds. Add chopped onion and fry till they are translucent. Now, add ginger garlic paste and cook for 30 seconds. Add chopped tomato, turmeric, coriander powder, chili powder, and salt. Cook until the tomatoes become soft and the oil starts to leave from the sides. 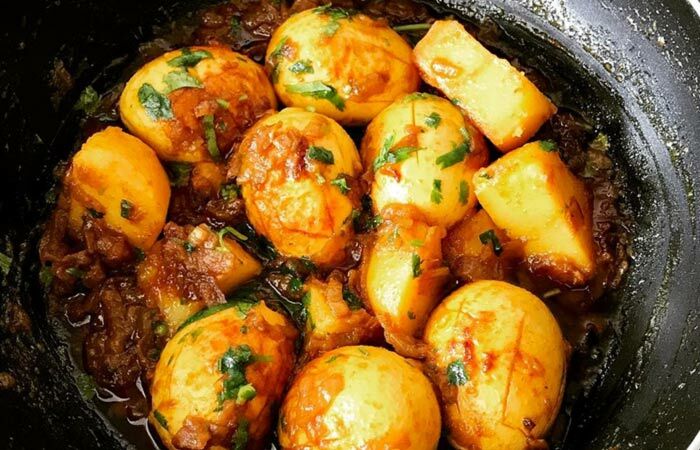 In the meantime, cut the boiled potatoes into medium sized cubes. Add the potatoes to the pan and stir well to coat them with the curry paste. Add water and cover. Cook for 2 minutes. Add the eggs and cook for 5 minutes. Heat 1 teaspoon oil in a pan and add cumin seeds, coriander seeds, and fennel seeds and fry for 20 seconds. 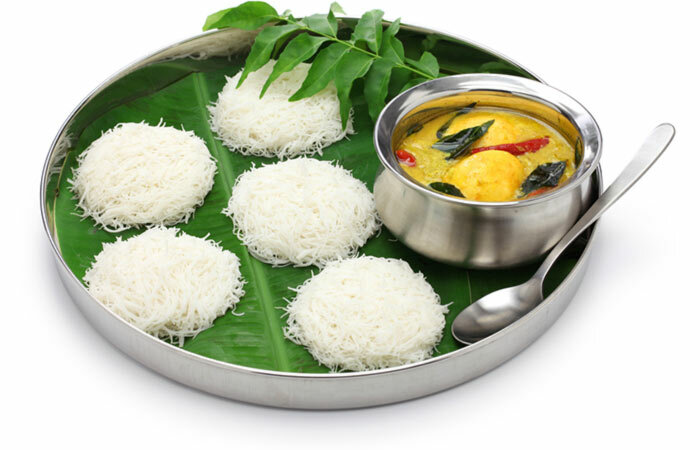 Add grated coconut, dry red chilies, and black peppercorn and fry until the coconut turns brown. In the meantime, add oil to a pan and fry the eggs. 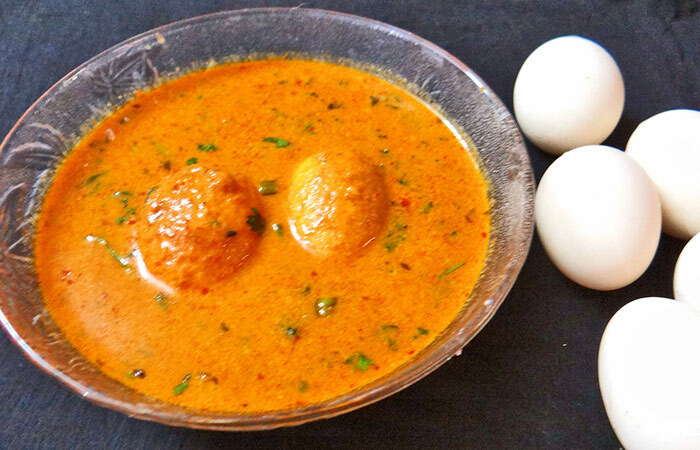 Remove the eggs and in the same pan add mustard seeds, cumin seeds, and curry leaves and let it crackle. Meanwhile, toss the roasted spices and a little water in a blender and blend it into a smooth paste. Now, add the ginger garlic paste into the pan and cook for 20 seconds. Add tomato puree, turmeric, chili powder, Kashmiri chili powder, and salt and cook until the oil starts leaving the curry paste. Add the roasted spices and cook for 2 minutes. Add water and cover with a lid. Cook for 3 minutes. Add the eggs and green chilies and cook for 5 minutes. Finally, add lemon juice and stir well. Heat the oil and add fennel seeds and chopped white parts of the scallions. Add the chopped onion and cook until they become translucent. Add the mushrooms and bell pepper and saute for about 30 seconds. Add chopped tomato, turmeric, coriander powder, chili powder, salt, and cumin powder. Cook until the oil starts leaving the curry paste. 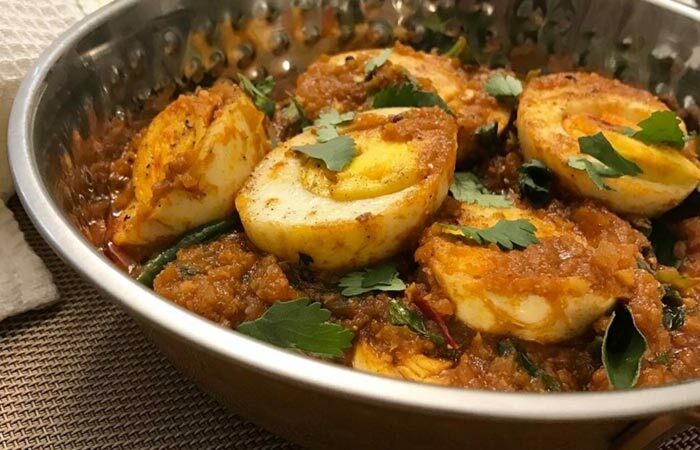 Add the eggs first and coat them well in the curry paste. Add water and cover with a lid. Cook for 4 minutes. Remove from flame and garnish with green parts of the chopped scallions. Heat the oil in a pan and toss in the cinnamon and cumin seeds. Fry for 20 seconds. Add the chopped onion and cook until golden brown. Add ginger garlic paste and cook for 20 seconds. Add the pureed tomato, chili powder, garam masala, turmeric, and salt. Cook until the oil starts to separate. Add green chili, sugar, vinegar, and water. Cook for 4 minutes. Add the eggs and cover with a lid. Cook for 3 minutes. Heat the butter in a pan and add ginger garlic paste. Cook for 10 seconds. Add chopped onion and cook till they are translucent. Remove from flame, cool, add soaked cashew nuts and grind into a paste. Heat oil in a pan and add the paste, Kashmiri red chili powder, garam masala, and salt. Cook for 2 minutes. Add fresh cream and cook for 2 minutes. Add the eggs and coat them well with the curry paste. Add water and kasuri methi. Cover with a lid and cook for 3 minutes. Heat the oil in a pan and add mustard seeds. Let it crackle. Add bay leaves, curry leaves, andblack peppercorn and fry for 10 seconds. Add chopped onion and cook until they turn translucent. Add ginger garlic paste and cook for 30 seconds. Add tomato, coriander powder, cumin powder, and turmeric powder. Cook for a minute. Now, add water and tamarind paste and let it come to a boil. Finally, add the eggs and cover with a lid. Cook for 5 minutes. 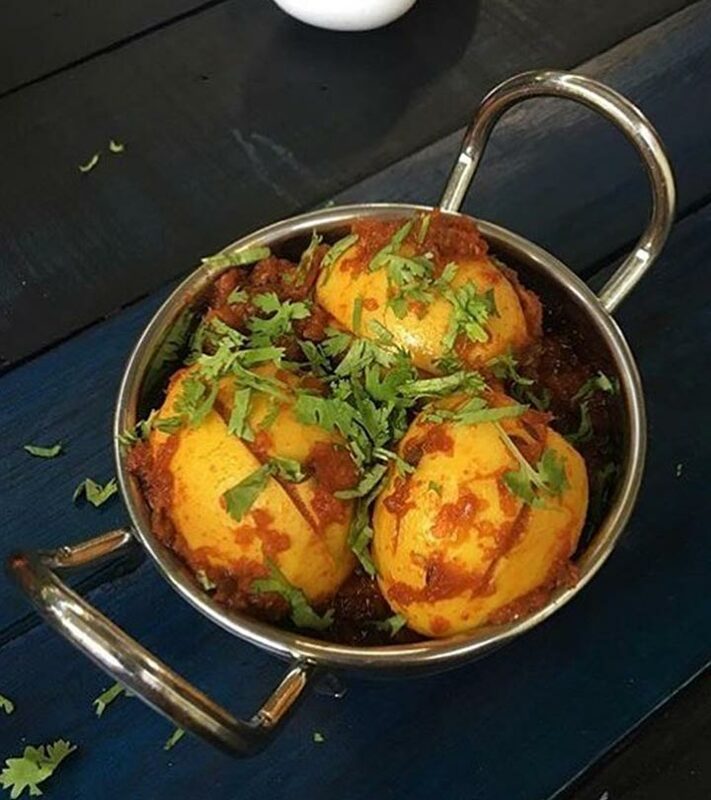 Crack open the eggs in a bowl. Add sliced onions, chopped green chili, and salt. Whisk well. Heat 1 teaspoon oil in a pan and pour the whisked egg. Spread it all over the pan and cook for 2 minutes on each side. 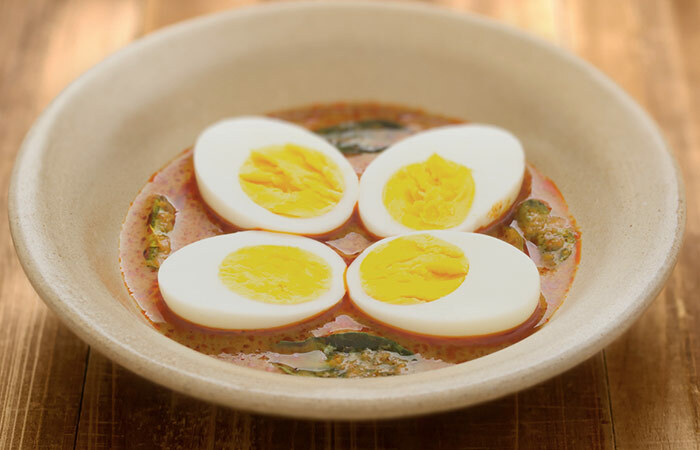 Transfer the cooked egg into a plate and cut it into four pieces. Now, in the same pan add 3 tablespoons oil. Add cardamom, cinnamon, clove, and bay leaf. Let them crackle. Add the chopped tomatoes, turmeric, coriander powder, cumin, chili powder, and salt. Cook until the oil starts to separate. Add the egg omelet pieces and slit green chili. Cover with a lid and cook for 5 minutes. Use a blender to make cashew paste. Heat the oil in a pan and add bay leaves. Add garam masala, turmeric, chili powder, Kashmiri chili powder, cashew paste, and salt. Cook till the oil starts separating. Add water and kasuri methi and cook for 2 minutes. Add the eggs and cover with a lid. Cook for 5 minutes more. Heat oil in a pan and fry the eggs. Remove them from the pan and keep aside. Add ginger garlic paste and fry for 30 seconds. Add tomato puree, turmeric, smoked paprika, fish sauce, tamarind concentrate, salt, and brown sugar. Simmer for 10 minutes. Now, add the eggs and simmer for 2 more minutes. Heat oil in a pan and fry cloves, ginger, garlic, onions, poppy seeds, peppercorn, grated coconut, and dry red chilies. Cook till the onions become pink. Add chopped tomatoes and cook for 2 minutes. Transfer this into a blender and blend it into a paste. 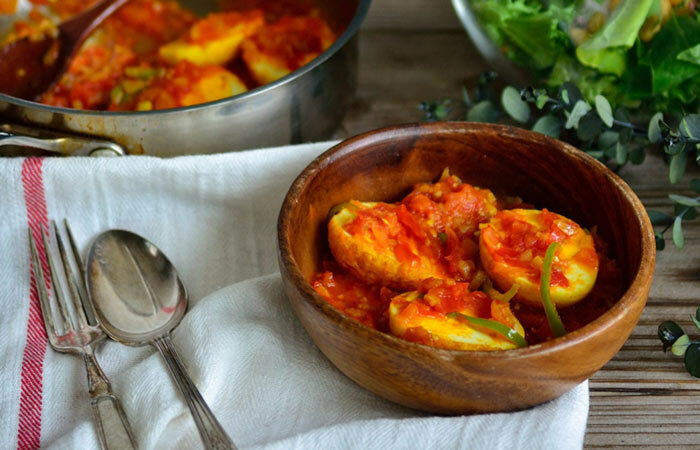 Add a pinch of turmeric and a pinch of red chili powder to the eggs and fry them. Keep them aside. Heat oil and add the paste in the blender. Add coriander, cumin, turmeric, and salt and cook till the oil starts separating. Add water and simmer for 7 minutes. Add the eggs and cook for 3 minutes more. Use a fork to prick the eggs all over. Heat oil and add cumin seeds, dill seeds, cinnamon stick, pandanus leaf, and curry leaves. Fry for 20 seconds. Add chopped onion and fry until they are soft and translucent. 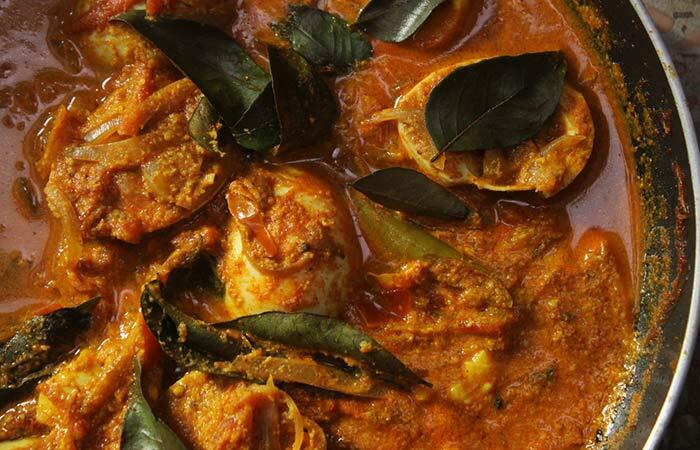 Now add the Maldive fish flake, cumin powder, chili powder, turmeric powder, salt, and coconut milk. Simmer for 10 minutes. Add the fried eggs and cover with a lid. Cook for 5 minutes more. 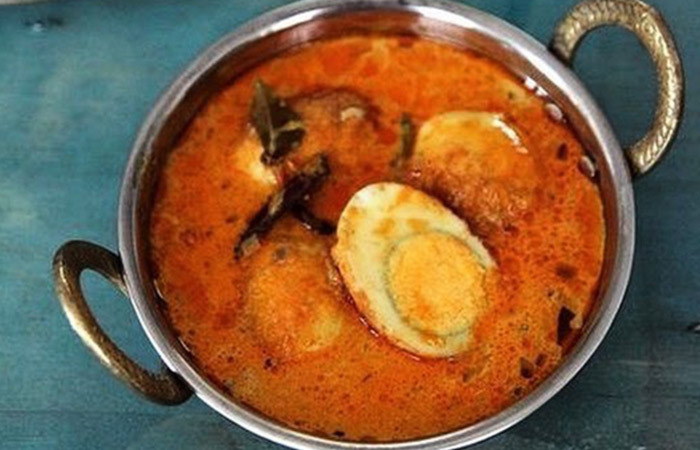 So, there you go—15 delicious and extraordinary egg curry recipes for you to cook. Try them out and let us know which one you like the best and why by commenting in the box below. Happy cooking!